It just isn’t the holidays until the Gay Men’s Chorus of Los Angeles presents its annual musical extravaganza, Holiday Spectacular: Festival of Carols, and their 2013 performance once again lived up to its name. Full of color, theatrical performances and special guests, the show has become a holiday tradition for families throughout Los Angeles. 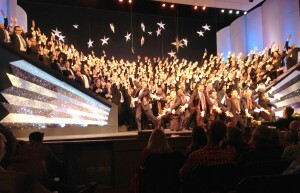 Led by new artistic director Dr. Joseph Nadeau, who comes to the chorus following 15 years as the artistic director of Heartland Men’s Chorus in Kansas City, GMCLA held its 2013 Festival of Carols performances Dec. 14 and 15 at the AlexTheatre in Glendale. 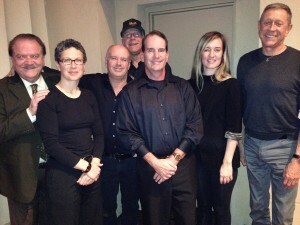 The powerful 240-voice chorus was joined by a Local 47 live band contracted by Earle Dumler comprising Cassandra Nickols on synthesizer and piano, Mitchel Holder on guitar, Kenny Wild on bass, and Megan Foley on drums. Also on stage were GMCLA youth ensemble Outside Voices, consisting of young LGBTQIA (lesbian, gay, bisexual, transgender, questioning, intersex, and asexual) people aged 14 to 24. Going on its 35th year, the Chorus has built an international reputation for musical excellence while remaining deeply rooted in service to the Los Angeles community. GMCLA has more than doubled in size to more than 200 singers, added professional and artistic staff, toured nationally and internationally, released 13 compact discs, commissioned more than 300 new works and arrangements and appeared frequently on national television. Founded in 1979, GMCLA strives to create musical experiences that strengthens its role as a leader among LGBTQIA and performing arts organizations, support LGBTQIA youth, challenge homophobia, and expose new communities to the message of equality. Local 47 President Vince Trombetta backstage with Megan Foley (drums, Kenny Wild (bass), Mitch Holder (guitar), Joe Stone (woodwinds), Cassie Nichols (synthesizer), and Earle Dumler (contractor). This entry was posted in All News and tagged Festival, Gay Men's Chorus of Los Angeles, Holiday, live music, Los Angeles on January 1, 2014 by admin.